Q. It looked like your foot was fine. Can you talk about how that felt today. RAFAEL NADAL: Well, very happy to be in semifinals, first thing. My foot is not fine. But, you know, we are in quarterfinals of Wimbledon. Is an emergency, so I had to play. So we decided to sleep a little bit the zone of the foot to play the rest of the tournament, and that’s what I gonna do. For me is the last tournament in one month, or in one month and a half, so I have to try my best. Is always for me a dream play here in Wimbledon. I’m in quarterfinals and I had to do, and I gonna do for semifinals, too. RAFAEL NADAL: When you sleep the foot you don’t feel nothing. RAFAEL NADAL: I told you. When you sleep the foot before the match, the anesthetic is for five hours, so you don’t feel nothing. Q. You said after Del Potro that you were worried. Is that still the case now, that you are worried about your foot holding up for the rest of the tournament? RAFAEL NADAL: No, I’m not worried about my foot. I went to the hospital. I did the MRI. I did the echo here, the ultrasound here. We didn’t see nothing real important. If you have something real important you have to go out of the tournament. I don’t have nothing really important. I have pain on the foot. I cannot run in perfect conditions without sleep the foot. But with the I don’t know how exactly to say in English. Is strange for me. The anesthetic there I don’t feel nothing, I don’t feel the pain. Q. So today you feel like you played pretty well overall, very good at times? RAFAEL NADAL: I play really well the first two sets. Probably I lost a little bit of intensity in the third. Playing in this kind of surface, especially here on grass, if you lost a little bit the intensity, you play less aggressive, is always very difficult, no? And he did well. He started to play little bit more aggressive, and I was in trouble on the third, the beginning of the fourth, too, a little bit. Q. What were your reactions to the Federer loss today? RAFAEL NADAL: Well, I am sorry for him. He was playing really good tennis in Roland Garros three weeks ago, four weeks ago, and during this tournament I saw him play really, really well. Today he was winning against a difficult opponent two sets to love, and my opinion playing very good tennis. I left. I didn’t see the match. But you know how difficult is this surface, how difficult is everything. Because when you play against one player like Tsonga that he has this fantastic serve, you are under pressure all the time even if you are winning two sets to love, because you have a break, you have few mistakes with your serve, he has a break, probably he has the set. And that’s every time. So you play under pressure all the match. I cannot talk a lot more about the match because I didn’t see the rest. I only saw the first two sets. So for him I think he deserved to be there. Q. Your recent matches with Andy have been semifinals and you have won them. What mental edge does that give you going into this one? RAFAEL NADAL: Well, every match is completely different. Every year is a different situation. Last year I beat him here in the semifinals, but was very close match, even if was in straight sets. Second set he had a set point with his serve. So, you know, the match will be very difficult for me. I think he’s playing at very, very high level. We’ll see what’s going on. For me the last few months of Andy was very, very good. We will see what’s going on in that semifinals. Will be a big challenge for me, and I gonna try my best. For sure I always enjoy playing these kind of matches. For me be in semifinals is a very positive result, so very happy for that. Right now everything is to win. I have to enjoy the moment, play aggressive. Only like this I going to have any chance to be in the final. Q. Is Andy a better player this year than he was at this time last year? RAFAEL NADAL: I don’t know. Q. You mentioned the two of you have been able to become good friends off the court. I wonder how often you saw him off the court and what kind of things you did together? RAFAEL NADAL: Normally we play PlayStation outside the court when we are in the same hotels in the tournament. Now he really don’t want to play more. He lost the last few times (smiling). Well, no, seriously. Well, seriously, that’s true. He lost almost every time. He played with his friend Danny against Monaco and me, and we won. Q. Mardy Fish did not have a fantastic serving day today. Could you speak about what he did that was a challenge for you. Talk about how you thought Mardy played. 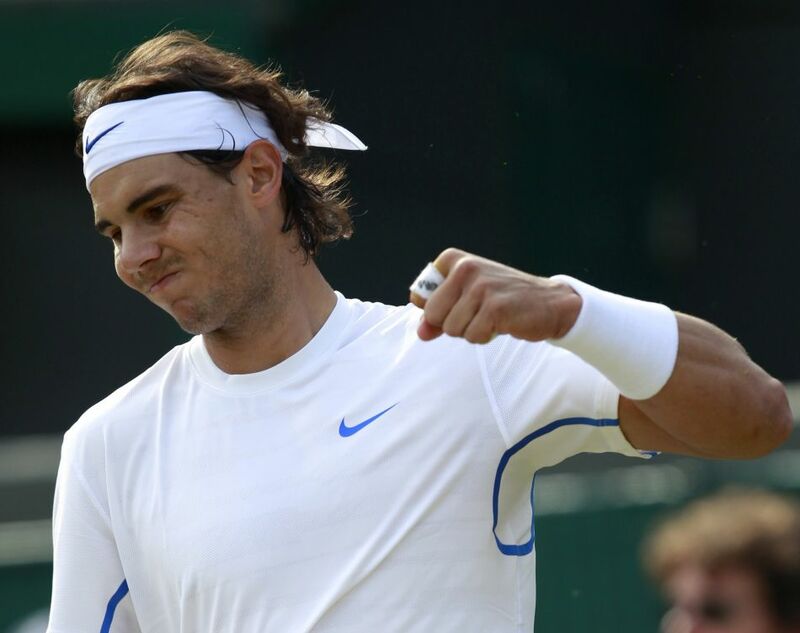 RAFAEL NADAL: I think Mardy improved his level, especially the last few years. And last year I think he had a fantastic season. I have a question, sorry. In Cincinnati he played the final last year or he played the semifinal? RAFAEL NADAL: Final against Roger, no? RAFAEL NADAL: So he’s doing well. I think he’s more solid player than few years ago, for sure. He’s playing much better with the forehand than before. Because always he had a very good backhand and very good serve and good volley, but the forehand, in my opinion, he’s hitting much better the forehand than before. And probably his movements are better than before. So I think the mental part is important. Seriously, in the past he probably was little bit more irregular player. Now he’s able to play more focus most of the time. In my opinion, his level in general improved a lot for that reason. I am always in trouble playing against him. I think everybody is in trouble playing against Mardy. He’s a very good player. Q. 2004 Estoril, before you became a big, big player, could you talk about what the foot injury was there. RAFAEL NADAL: No, I had to stop for three months and a half. Q. What was the foot injury? RAFAEL NADAL: I had a stress fracture. Q. So that’s what it felt like two days ago? RAFAEL NADAL: It’s not the same place. I told you. Is a completely different place. I felt something similar, but I am lucky that is nothing like this.